Those who are looking for affordable homes in the inner city of George Town should check out the Chelliah Park City development in Jalan S.P. Chelliah. Developer Zubicon Sdn Bhd is conducting a registration roadshow at D’Piazza Mall in Jalan Mahsuri, Bandar Bayan Baru, from 9am to 5pm today. Zubicon managing director Lim Beng Keong said the project with the Penang Development Corporation would house 883 units with built-up size of 800sq ft priced at RM200,000, 165 units of 900sq ft (RM300,000) and 275 units of 1,000sq ft (RM400,000). “The response is overwhelming and the state government has released the names of 770 applicants to us for this project. “Imagine owning a unit in the inner city of George Town by paying only RM250 per sq ft for the 800sq ft units. 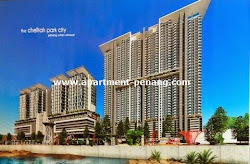 “Normally it will cost between RM550 and RM600 per sq ft. This is definitely a good deal,” he said during a press conference organised by state Housing, Town and Country Planning Committee chairman Jagdeep Singh Deo at Komtar on Thursday. Jagdeep said Penangites should grab the opportunity to own affordable homes in George Town since the state had allowed applicants to choose the project they were interested in. “People have to bring the relevant documents to register for this project,” he said. Jagdeep said the state had received about 4,000 applications for affordable homes in the state. “We urge the private sector to build 100% affordable housing,” he said.